- The G string offers the greater range of overtones that we admire in old Italian instruments. It gives you both depth and brilliance at the same time. This is why it is suitable for almost every violin. - The D string projects well and responds clearly at every dynamic. Hydronalium is not used in the outer winding which means that there isn't a problem with corrosion caused by perspiration. The set is well balanced and there is no drop in projection on the D string. 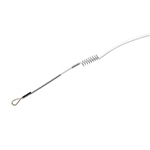 - You can choose from two different A strings. The synthetic A gives improved tone and response. 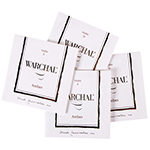 The metal version combines the best qualities of the Warchal metal A string line, namely the Russian A and Avantgarde. 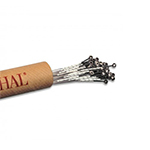 There is a short helix in the bowed area similar that found in Warchal helix E strings. 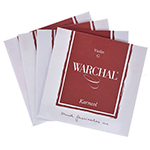 - The E string utilises Warchal's legendary helix invention that makes the tone warmer and prevents whistling. The tension is precisely balanced to provide both playability as well as projection. 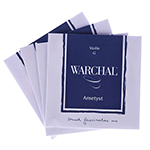 The E string utilises Warchal's legendary helix invention that makes the tone warmer and prevents whistling. The tension is precisely balanced to provide both playability as well as projection. The Timbre string set is the best that we have made so far. It utilizes all of our knowledge and experience. It combines gut-like sound and response with the extra projection and stability that synthetic strings can deliver. The Amber string set has been developed with the aim of achieving the sound quality of the best gut strings without any tuning instabilities. The set features W-Core?, a completely new core material developed by our Research & Development team.